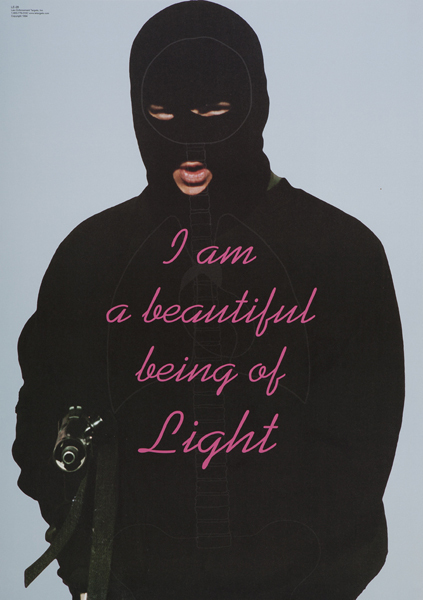 Tony Garifalakis’ Affirmations is a series of collages that explore the belief systems that underpin the New Age movement and gun culture groups. It consists of texts taken from a variety of New Age and self-help sources such as positive affirmation cards, books of aphorisms and bumper stickers, that are then superimposed onto paper shooting targets. 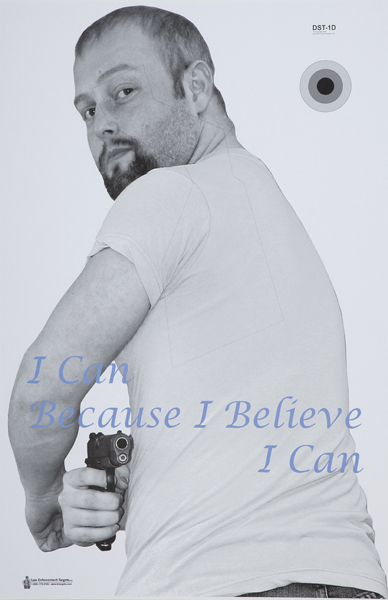 Tony Garifalakis’ Affirmations is a series of collages that explore the belief systems that underpin the New Age movement and gun culture groups. It consists of texts taken from a variety of New Age and self-help sources such as positive affirmation cards, books of aphorisms and bumper stickers, that are then superimposed onto paper shooting targets. 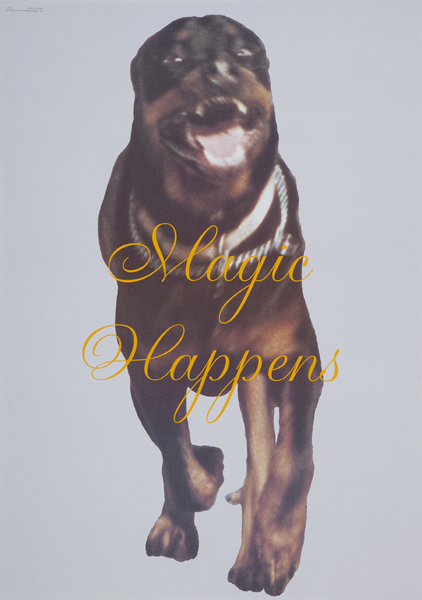 Garifalakis juxtaposes new age clichés with confronting images to disrupt the relationship between form and message and expose the dissonance between intention and action, self-belief and actuality. Throughout his career Garifalakis has mined books, film and popular culture and explored society’s follies and anxieties through recurrent themes of conspiracy theories, extremism, anarchism, cults and the apocalypse. Tony Garifalakis lives and works in Melbourne, he completed a diploma in Graphic Design at Victoria College, Prahran in 1985 and MFA (Painting) at RMIT University in 1999. 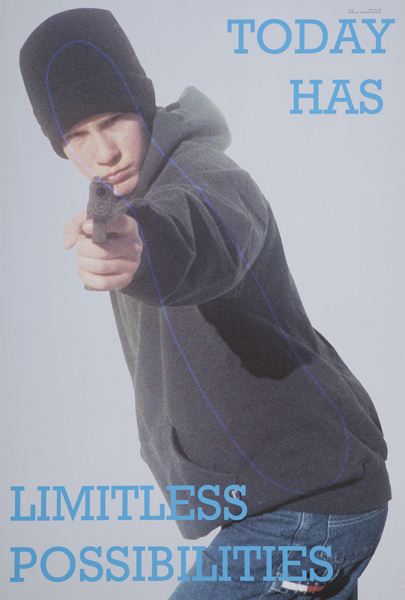 Garifalakis has held solo exhibitions including: Denimism (with Tully Moore), West Space, Melbourne (2012); Tony Garifalakis and Richard Lewer, Hugo Michell Gallery, Adelaide (2012); Department of Misanthropic Affairs, db Projects, Sydney (2012); Mutually Assured Destruction, Ryan Renshaw Gallery, Brisbane (2011); The Misery of Philosophy, Curro Y Poncho, Guadalajara, Mexico (2011); The Philosophy of Misery, Yautepec, Mexico City, Mexico (2011); Bad Scene (2010), Cover Ups (2008) and Paradise Slaves (2006), Uplands Gallery, Melbourne; New Work, ISCP, New York (2008); Infinity Land, Hell Gallery, Melbourne (2008); Detritus, Dudespace Gallery, Melbourne (2006); The Spectre Smitten (2003) and Bad blood (2000), Centre for Contemporary Photography, Melbourne; as well as at Gertrude Contemporary Art Spaces, West Space, Penthouse and Pavement, First Floor Artists and Writers Space, TCB Art Inc, MIR 11 and Bus, Melbourne. He has also contributed to many group shows in Australia and internationally, including at MONA, Hobart; National Gallery of Victoria, Melbourne; Artspace, Sydney; Apexart, New York; Galerie Desaga, Cologne; Galerie Sans Titre, Brussels; De Brakke Grond, Amsterdam; Boots Contemporary, St Louis, USA; Silvershot, Melbourne; University of Queensland Art Museum; ISCP, New York; CCP, Melbourne; Death Be Kind, Melbourne; Margaret Lawrence Gallery, Melbourne; Zoo Art Fair 2006, London; Bureau Gallery, Manchester; Melbourne Art Fair 2012; The Physics Room, Christchurch; Palazzo delle Prigioni, Venice; Het Wilde Weten, Rotterdam; Vamiali’s Gallery, Athens; Musee de la Civilisation, Quebec; Deste Foundation, Athens. Tony Garifalakis’ work is held in collections including The Museum of Old and New Art, Artbank, Monash University Museum of Art, National Gallery of Victoria, Art Gallery of South Australia, University of Queensland Art Museum, ANZ Art Collection, as well as private collections in Europe, Australia and the United States of America.